Lips are susceptible, but do you know why? There are millions of nerve endings around lips, while they are not protected, but exposed to environmental influence. The reason lips get dried so fast, is they lack sweat glands. To avoid dehydration of your lips, you could apply homemade lip balm recipes with beeswax. You don’t need to have chapped lips to take care of them. Whether it is cold weather and wind in the winter, or you have substantial exposure to the Sun and seawater in the Summer, you have to protect, soothe and nourish your lips throughout the whole year. Ancient people have uncovered the positive effect for skin when using beeswax. Nowadays beeswax consumption is increasing each year because more and more individuals pay attention to their skin care and hair care. They get back to natural ingredients, and solutions and products. Many natural cosmetic products include beeswax in their formulas. The good news is you can easily utilize the beeswax properties, including in homemade lip care solutions. For that purpose, you can mix it with other valuable ingredients, like carrier oils and essential oils. Let’s see which basic rules it is good following, to have robust natural protection for your lips. What ingredients to use for a homemade lip balm? You can store the lip balm in a small plastic or metal container. Here are a few useful rules of thumb, you could follow, when preparing your homemade lip balm. 1. Solid oil/butter is heavier than the liquid one. If you use predominantly solid oil, you could add less quantity, vs. liquid oil. 3. Essential oil is a concentrated form of extract. Be careful not overusing it. As a rule, two-three drops per dose are usually enough to get the aroma and sensation aimed. 4. Typically, in the winter you might want a more dense mixture, than in the summer. You can always regulate the density, by adding more beeswax, if you want to increase it. 5. Vitamin E is not a must but will help nourish the delicate lip skin. A few drops per doze is fine. 6. As a consequence, you would first melt the beeswax down and add the carrier oils, until reaching homogeneous mixture. Finally, you would add essential oil and vitamin E, stirring well. 7. You can use any container you have at home. It could be your empty face cream container, you kept by chance, or for the purpose:) Make sure it is clean and dry. Don’t close the lid, before the mixture solidifies. 8. Typically, the expiration period of your lip balm will be about 1 year. 9. You can always experiment with flavors, ingredients, and quantities. Follow the core rules, and you will happy with the result. Your next step to produce the desired lip balm will be mixing all components in the right ratio. Read below a few ways how to do this. All of them are very quick and easy DIY solutions. 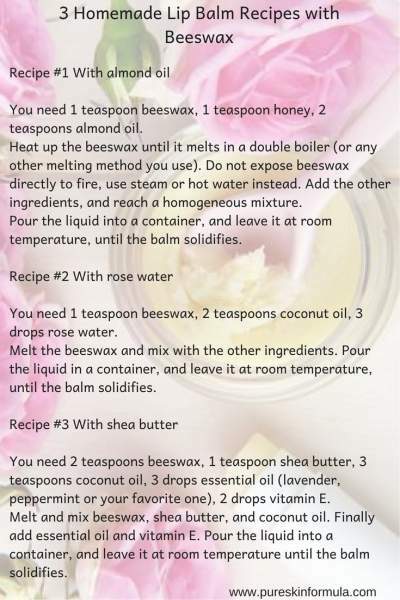 You need 1 teaspoon beeswax, 1 teaspoon honey, 2 teaspoons almond oil. Heat up the beeswax until it melts in a double boiler (or any other melting method you use). Do not expose beeswax directly to fire, use steam or hot water instead. Add the other ingredients, and reach a homogeneous mixture. Pour the liquid into a container, and leave it at room temperature, until the balm solidifies. You need 1 teaspoon beeswax, 2 teaspoons coconut oil, 3 drops rose water. Melt the beeswax and mix with the other ingredients. Pour the liquid into a container, and leave it at room temperature, until the balm solidifies. You need 2 teaspoons beeswax, 1 teaspoon shea butter, 3 teaspoons coconut oil, 3 drops essential oil (lavender, peppermint or your favorite one), 2 drops vitamin E.
Melt and mix beeswax, shea butter, and coconut oil. Finally add essential oil and vitamin E. Pour the liquid into a container, and leave it at room temperature until the balm solidifies. It needs a bit extra effort to buy the ingredients and to develop the beeswax recipe at home, but in the end, the aim is worth it- you will have your lips protected. Apart from the DIY approach, you can always purchase lip balm. I recommend exploring natural cosmetic products, which will take the best of two worlds – using natural ingredients, and professional knowledge, how to combine them most appropriately. I’ve shared with you tips how to search and find qualitative natural cosmetic products, avoiding scams and improper statements from sellers. I would love to hear from you! 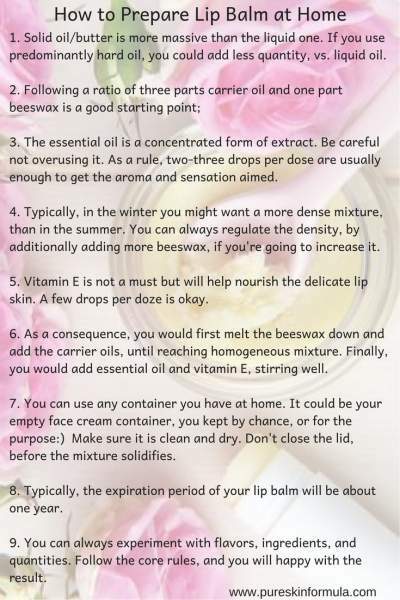 Do you (plan to) to use beeswax lip balm? Leave me a comment, and I will answer you! Thank you for the recipes! I think I’m gonna try the almond and shea butter recipe and use a little vitamin E oil as you suggested in your post. I can easily get the beeswax from my neighbor that sells honey from her hives:) She’s made me a lip balm in the past and it’s wonderful! Thanks so much for the simple recipes. I’ve never made my own lip balm before but this makes seems pretty simple so I might give it a try. What type of containers is it best to put homemade lip balm in? Thank you for your comment. Yes, it is not difficult at all. 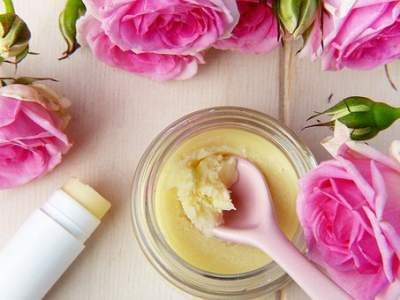 In fact, homemade lip balm is one of the most comfortable cosmetics you can prepare alone! Plastic containers are great. You can buy such, but you can use ones, from previous cosmetic products (including lip balm) that you have already exhausted. Make sure they are clean and dry, and they have a lid to cover the ointment. I’ve made several lip balms before…these also look worth a try! I’ve never tried adding rose water, so I will be trying this! Thanks! This is seriously going to help. Never even considered making my own, but as much as I spend on these products, I might as well give it a go. Thanks for this! Agree with your point! I’ve always said, that the homemade solutions do not contrast with purchased natural cosmetic and sanitary products. They can be used both, as they have their downsides and advantages. Many people these days turn to natural products. Coconut oil, other nut oils, and seed oils, as well as many essential oils, are a great material for producing lip balm. Lip balm, that’s my life saver – can’t be without one. My lips are so dry, especially during the winter season. One of my favourite lip balms contains honey. I’m surprised to hear that a homemade beeswax lip balm has got a storage life up to one year. I thought it would be necessary with some kind of preservatives. That must be healthier to use your own homemade lip balm without the many unnatural substances which the cosmetic products often contain. The shea butter beeswax is extremely healthy, added with coconut oil and vitamin E. Wish I had the time to produce one myself. Enjoyed reading this excellent post! Thank you for the beautiful comments! Yes, beeswax is durable, especially if we keep it at a cool place, so it is not exposed to excessive climate conditions. Is domestic product healthier, than purchased natural cosmetics? I can not claim that. If both are adequately produced, they are safe. If you are questioning the synthetic cosmetics, here I will have to agree with you, it could hide risks for our skin and hair health. Valeria, thank you so much for your kind and competent reply. I have not yet tried it out, but I have for sure saved the recipe for the Shea butter recipe. If I buy a product, I’ll avoid synthetic cosmetics and look for natural products. Will have a look at your other posts now! Your valuable input is much appreciated:) I am happy I’ve helped you with some ideas about how to use beeswax! Hope you will like the other posts, as well, finding helpful insights on how to utilize the gifts of nature for our body, skin, and hair!